1-Sentence-Summary: The Millionaire Fastlane points out what’s wrong with the old get a degree, get a job, work hard, retire rich model, defines wealth in a new way, and shows you the path to retiring young. Ironically, this is not a get-rich-quick book. To the contrary, it’s approach is very stoic. Ever since seeing a guy with a legendary Lamborghini Countach, MJ DeMarco knew he wanted to live a rich life. What he didn’t want is to get a degree, work 40 years, save every penny, retire and then, eventually, be able to drive his Lamborghini at 70 years old. The Millionaire Fastlane is his story of how he managed to retire at 33, a multi-millionaire. Wealth stands for 3 things, but none of them is money. Hit the pedal to the floor, we’re going in the fastlane! Lesson 1: Wealth stands for 3 things, none of which is money. 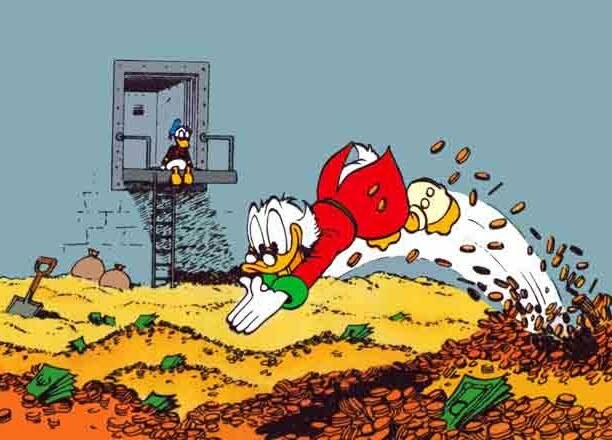 When you hear the word wealth you probably imagine Scrooge McDuck swimming around in his vast sea of gold coins. However, DeMarco came up with his own definition of wealth, which isn’t really about money. Number 3 is where the money comes in. While money can only help you so much in building better relationships with your loved ones or transforming your body from unhealthy to top shape, money can buy you unlimited amounts of freedom. The freedom to live where you want, eat what you want, travel where and when you want and follow all of your hobbies with a passion, even if they’re really expensive. Since you don’t have to trade your time for money any longer, you can now spend it as you wish and that’s really what wealth is all about. Lesson 2: Your income eventually can’t depend on your time any more. Okay, but how do you stop trading your time for money? To make your income independent from your time, you have to unlink it from the hours you put into work. This doesn’t have to happen in one go where you become an “overnight success”, but can be a gradual process. For example J.K. Rowling put in years of time before publishing even the first Harry Potter book, but with each new book she continued to receive royalties, increasing her income without her having to put in more time, since that book was finished. The truth is, even the most miraculous exits, where 15-year olds sell their app to Yahoo for millions, require years of work and very often the company owners have already become rich in the process. The fastlane might be fast, but it’s not a shortcut. There are no shortcuts. You have to build a great product or company that starts to produce passive income, even when you’re sleeping. Exit or not, that’s the way to become rich and retire young. Lesson 3: Start producing, stop consuming. This one speaks right from my soul. Stop consuming, and start creating! DeMarco says the only way to build a business is to think like a producer. We’re all conditioned to consume from an early age. Watch ads on TV, buy toys, buy food, buy clothes. It’s no different with information – we’re bombarded with tweets, images, articles and podcasts. But when you spend all your time consuming, when are you going to start creating? So stop throwing money at another pair of shoes or skincare product, and instead, switch into producer mode. How does it feel? What does it do to make you want to buy it? Which words are they using in the ad? See behind the consumption to find out about the creative process of the people who sell what you usually buy. Could you sell that product? Where do they produce? Can you find out how much profit they make? Similar with good articles or podcasts. Think about the structure, how does it help you? What makes a great blog a great blog? Take off your consumer glasses and be open and curious about the world of producing and you’ll be well prepared to start your own business. I really like MJ DeMarco’s message. It feels real, down to earth, and not blown out of proportion. He struggled for years until he found the right business, eventually sold his, bought it back and sold it again years later. But he never gave up. He kept creating, producing, having fun and eventually reaped the rewards. If you’re looking for motivation, inspiration and a few good starting points for seizing control of your own life, The Millionaire Fastlane is a great start. It’s an entirely different mindset from The 4-Hour Workweek, but just as unconventional. Who would I recommend The Millionaire Fastlane summary to? The 15 year old with a lot of free time, so she might have a chance to retire super early (before 30), the 32 year old store clerk, who loves the products he sells, but has never quite looked behind the curtain, and anyone loves Lamborghinis.